Dario and his family have been running the Hotel Villa Maria in Ischia Porto for generations. He is also heavily involved with Circolo Georges Sadoul in the Hotel, providing education and restoration services for Guevara's Tower. I met Dario on Couchsurfing, not looking for a place to stay, but for a local to interview for the project. He responded with an open heart saying he would be very pleased to take me around and talk. We decided to meet at his Hotel, the Villa Maria. I waited outside thinking that he would come out of the reception area and to my surprise Dario met me on his Vespa and said, "Here this is for you," and handed me a extra helmet. It became quickly evident that this wouldn't be a normal interview and I wouldn't be recording a conversation. He started by telling me the agenda for the afternoon, Castle, Tower, Cafe, and Talking. We started off toward the castle and found some co-workers on the way. He invited all of us to come along with him and learn more about the area. He and I got a chance to talk while we waited for the other people to arrive. He first told me about his involvement with Ischia and little bit of history of he island. He and his family have been running the Hotel Villa Maria for generations and he pointed to the spot he was born just down the street from where were standing. You could see him looking at the buildings on the water like he was paying respect to ancestors. He first wanted to tell me about his projects and hobbies and then learn about mine. He told me about his involvement with the cultural center, Circolo Georges Sadoul, at the Hotel and how for the past couple of years they have been providing restoration services to the Guevara's Tower just south of the Castle Aragonese. He organizes art students from Germany to come in and help with documentation and restoration education. After a couple of his stories you can tell he is an expert on Ischia. Dario looked towards the Castle and told of its history. It was awesome to be looking at such a historical monument and be told stories of its importance by a local who practically had the Castle in blood. He told me about the different owners, battles that took place, and its current history. As the others arrived Dario told us about a fun tradition on the island. I had already heard about the importance of the Sunday family lunch, but I hadn't heard about how all the locals like to head to the Castle and get coffee on the bridge. After my friends arrived, he took us in to get a traditional small shot of espresso and be on our way. He even paid for all four of us. After the espresso he took us to a different view of the Castle and continued to tell us about the history of the area. We could see Capri in the background so I took the chance to ask, "So what is the relationship like between Capri and Ischia?" You always hear about the two so I wouldn't be surprised if there was a little island rivalry. He goes on to say, "Well, Capri is like the tall beautiful girl at the bar, and Ischia, well is, is like the short jolly fat man, both are great people, just different." We started to walk off towards the tower to see what he has been working on for the past couple of years. He went to park his scooter and we met him on another cobble stone side street. We followed him up through the maze of houses and took turns into alley ways that were the "old roads" before cars were on the island. Dario told us awesome history of the paths we were walking on. We stopped in the cemetery just before the tower and got a quick history lesson of the tombs beneath us. As we got to the tower, before we stepped in the door, Dario looks at us and says, "ha well this has been my life for the past four years." We got into the small tower and were met with a group of people setting up an exhibit on the main floor. I got the feeling of exclusivity since we had a worker taking us behind the scenes. This was supposed to only be a quick interview/chat in a coffee shop, so a backstage tour of the tower was blowing my mind. He told us that over the years people have tried to redecorate the walls of the tower with different paintings. Rather than erasing the old decorations, the new paintings were put right on top of the older material. This means that there were layers and layers of different history that they were uncovering. He said in some spots there were at least 21 layers of different wall decorations that they had found. As we went up the stairs he showed us some graffiti that had been written on the wall over the years. Some was standard rubbish graffiti, but some was way cooler. He pointed out one marking that was written in beautiful calligraphy dated 1912. Same words of wisdom that one would pass on to a reader today, but 100 years earlier. He took us to the top of the tower to show us the roof view of the Castle. Easily has been my favorite view of the Castle thus far. We took our rounds taking pictures and enjoyed the scenery. Dario spoke with some other workers in the area and we sat and took in the view. Once we got back down, our last stop was a house on the water near the port. He spoke of the significance of the brightly colored bold doors and awesome architecture. Meeting Dario started small but ended up being one of those experiences that each traveler longs for. We got taken around by an expert local and he showed us history and culture that he was passionate about. Although I didn't get an actual recorded interview, the physical interaction and tour was more than enough. 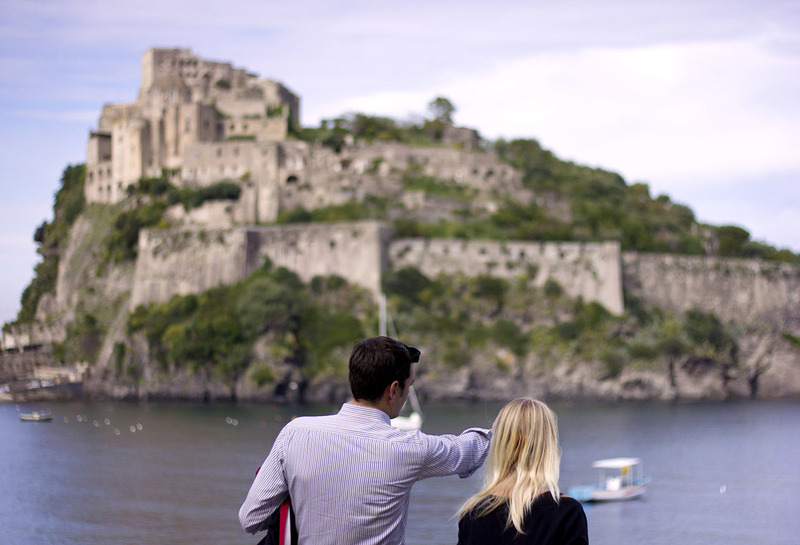 Dario set the tone for a whole other type of Ischiatani hospitality and culture on Ischia. Ci Vediamo.